This is his “trying to stand up” position! In today’s video you can see Noah going from plantigrade (feet and hands on the floor like a bear walk) to standing. As we have mentioned before, this kid does not like to bend his legs so he is making this harder on himself to try to stand with straight legs. He also doesn’t stay long in standing and tries to sprint to another location. I have a feeling once Noah starts walking I am going to have to buy a new set of running shoes! He can take a few steps without falling! Here he is standing up on his own! 1. Pulling to stand using objects or people. You can see our previous post that talks about some exercises to help prepare for this. This can be from sitting, kneeling, half kneeling, or squatting. 2. 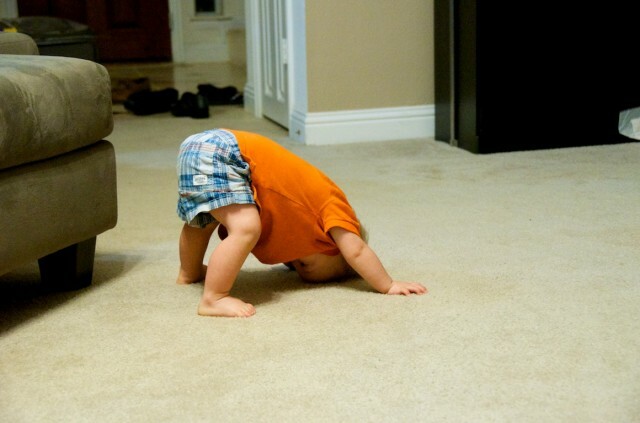 Encourage play in the standing position. Some of our favorite examples of toys for this are the Fisher-Price Laugh and Learn Fun With Friends Musical Table, the B. Zany Zoo, and Fisher-Price Little Super Star Sing-along Stage (which I recommend finding at a second hand store as they are no longer made but are frequently sold for insane prices on Amazon.) You can also put favorite toys on the couch and let your child play in standing that way as well. 3. Place your child in standing without something in front of them for support, for example with their back against a wall/furniture, or placing them in standing in the middle of the room. I found that I was the best motivator to keep Noah in this position, however you may have to hold toys to keep them entertained. 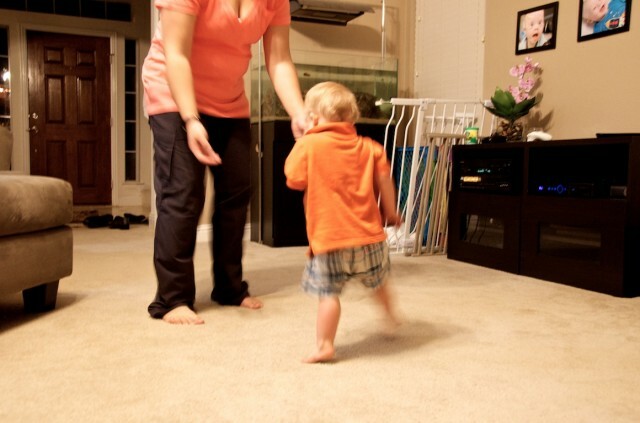 This is how we helped Noah learn to take his first steps. 4. Get into standing from a sitting position, for example sitting on a box/stool that puts their legs at a 90 degree angle and getting them to stand from there. This is a task I will admit we never worked on much outside of his therapy sessions but I wish we had. 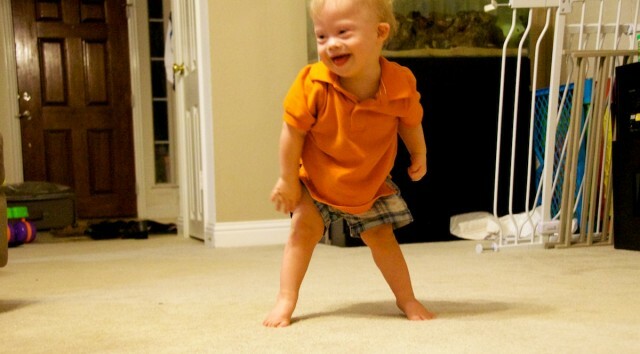 Today his hard work paid off as he is getting into standing on his own in the middle of a room. This is Noah’s last major motor milestone before becoming an official walker. Here’s that sitting to stand position again! 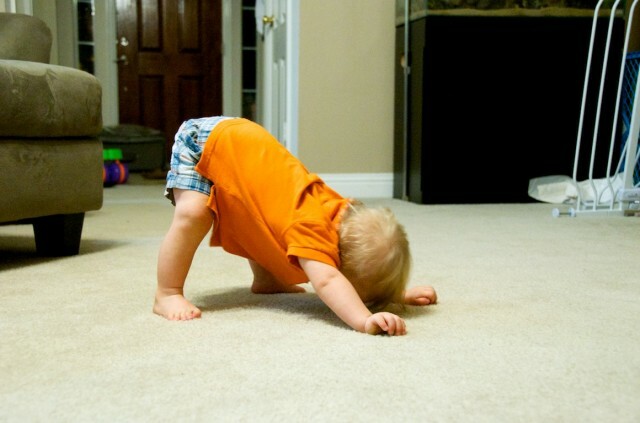 When did your child stand on their own? Did they start walking shortly after this? Do you have any other activities you found helpful for this? Hi. Congratulations for reaching a big milestone of walking. Sorry don’t mind me asking How young is Noah now? Check out the date at the front of the video. You can also check out http://sweltering-berry.flywheelsites.com/milestones for some more info by age. Just stay with it, he’ll come around! My girl has just learned to walk on her own but she still doesn’t get up, only holding our hands or on the couch. She’ s 2 and a half years old, we’ re so proud of her! I am a little behind reading my blogs, but your blog about Noah is one that I always read. I just love this little guy. He is trying hard here to stand. Once he has that down, I think he will go right from standing to running so Noah’s Daddy maybe you should buy your running shoes now. He is almost there and then you will be chasing him everywhere with his cute smile and sometimes mischievous grin. So cute. Love your family. Way to go Noah! Our Jake is finally walking now at 21 months! It was a long hard road getting here, and it still takes my by surprise to see him standing or come walking around the corner. But everytime he does he just lights up the room! Noah reminds me so much of my Mason. Mason is now 6 years old and and can do just about everything for himself. Mason will be starting regular kindergarten this fall . He has been in headstart for 4 years to get him ready. Please don’t let anyone tell you what he can’t do, our kids have the same rights as any other kids .We may have to fight a little harder for them but it is all worth it in the end!! that’s a great achievement.my girl is 1 year 10 months now but yet to stand-up. am encouraged by noah . this is a good page it helps a lot I like it. my daughter has trisomy 21 she such a light to us. I think is group is going to help us to know what others are doing. Just want to say I follow your page and I enjoy reading about Noah and his milestones, my son is 5 months with DS your tips are very helpful and I will continue to follow because your story is inspirational & gives me light and hope for my son Jaxon. my son age 21 months but can’t stand yet.why? Our son Michael is 23 months and can’t stand yet.He has very low muscle tone but he is work. My niece Ayat is a down syndrome baby. I’m seraching the web to gather some helping stuff for her. She is 2 years and a week, she can get up on her feet with support but not on her own. She hasnt learnt to walk yet but hopefully she soon will. I surely need to follow the exercises.